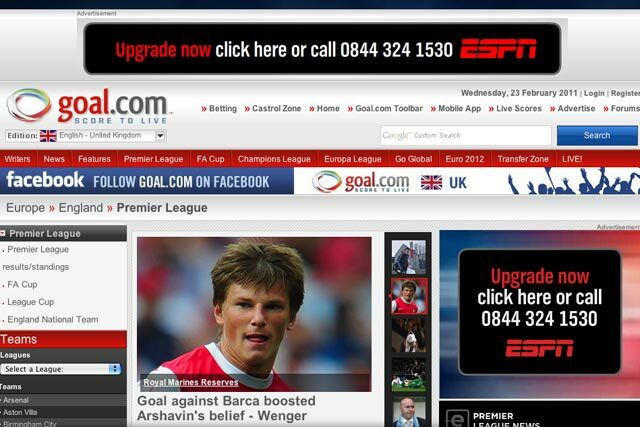 Perform, the online sports media and ad sales specialist, has expanded its reach with the acquisition of internationally popular football website Goal.com for an undisclosed sum. It has taken over the ad sales for the site, which were previously handled partly internally, and partly by Hi Media. Goal.com offers news coverage in 15 languages and was visited by 19.4 million unique users globally in January, according to comScore. It has more than a million followers on Facebook and an app on iPhone, Android and BlackBerry. The acquisition boosts Perform's reach in online sports media, where it is the number two commercial player in the UK after Sky, although it claims its video content reaches 20 times more users than any other commercial video provider. UK unique users in January totalled just under one million for Goal.com and 137,000 for its sister site, 101GreatGoals.com, according to comScore. BBC Sport was the top sports property with 7.7 million unique users, followed by Sky Sports with 4.5 million, and Perform with 3.4 million. Perform also represents Premierleague.com, which has 1.6 million unique users, while Sky owns the 365 group of sites, which has 1.1 million unique users. Perform owns or represents UK football websites, including Premierleague.com, Soccerway.com, EvertonFC.com, LeedsUnited.com, AVFC.com, Rangers.co.uk and CelticFC.co.uk. Jamie Wilson, Perform's managing director of UK sales, said: "Goal.com really complements our advertising portfolio. The flexibility of the platform and quality of the editorial and content offers brands great opportunities to integrate into the world's leading football portal." Perform will retain three executives including Jonathan Gamble, who becomes senior vice-president for commercial and sales. Michael Simpson, one of Goal.com's original founders assumes the role of senior vice-president for product and content, and Scott Rothrock will continue as chief technology officer. All three will report to Simon Denyer, joint chief executive of Perform. The sellers of Goal.com are a consortium of investors including Bessemer Venture Partners.